This model is designed to be surface mounted, recessed or freestanding. The patented locking mechanism is activated using a DAD 6 pin security rim lock conforming to EN 1303:2005 Grade 4. 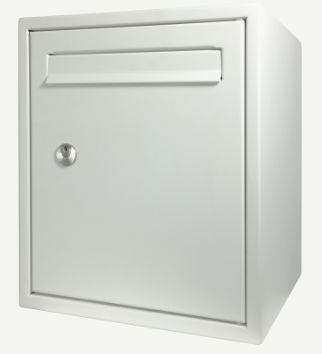 This box is supplied with an official Secured By Design certificate proving it has been successfully tested to provide maximum security against mail theft attempts. 300 x 110 x 320 mm. Three patented numbered keys per box. Lock with 30,000 variations, conforms to EN1303 Grade 4. Stainless steel hinge with security hinge covers.